Confit tomatoes gives you two wonderful things that you’ve done them. Absolutely amazing good tasty tomatoes with a lovely herb and garlic flavor. Soft and smooth that melts on the tongue. 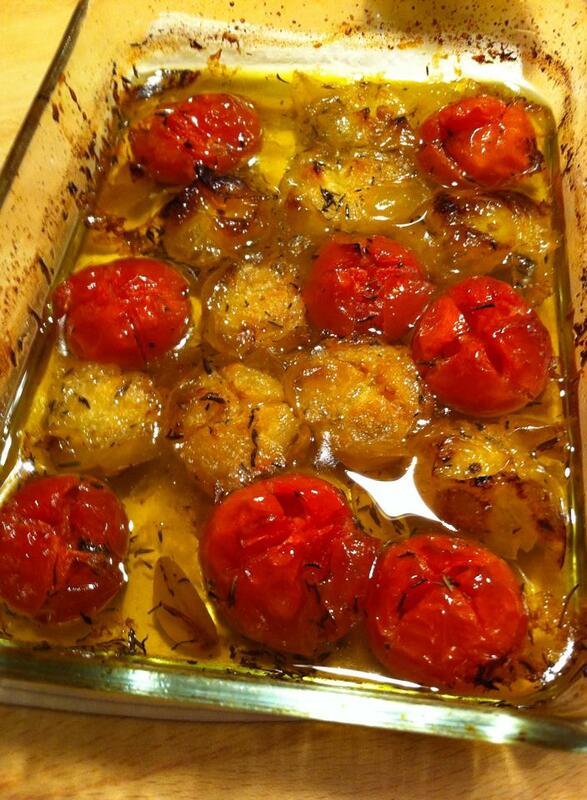 The oil you get after you’re done, have got a wonderful flavor of roasted tomatoes, thyme and garlic. Perfect dipping good bread into or in cooking as a seasoning. Rinse the tomatoes. Cut a cross in them and place in an ovenproof dish. Sprinkle with spices and garlic. Turn on olive oil so the tomatoes covered. Set the oven at 200c for about 30 minutes. Remove and let cool. Looks amazing! I bet the herbs on the tomatoes almost caramelize! My stomach is growling! I was just about to go on an olive oil tasting and am so excited to have found this recipe. I may have to get a nice oil to make this with! I know this sounds a little pretentious, but I love olive oil tastings, they are a lot of fun. You can do your own either at home or if you have a kitchen store near you that has various oils to taste. In order to taste the oil, you rub some on your lips and lick with just the tip of your tongue. As you do that, slurp in (like you were slurping soup from a spoon) and breathe in the aroma of the oil. Then curl your lip in and lick it and swallow. Good oil will feel smooth as it glides down the throat, cheaper oil will have a less aromatic flavor and will feel almost sticky to the back of your throat. You can do this with all kinds of oils and find really yummy ones that are great for dipping or cooking. This looks amazing. Do you pretty much have to use the oil that meal, or can you cool it, put it in a jar, and enjoy it over several meals by reheating what you need? I love tomatoes and garlic, but the idea of the flavor infused oil with some homemade bread would almost be the compelling reason to make this. Those look wonderful! I’d love some of those tomatoes and garlic makes anything taste good. Oh, roasted tomatoes! – nuffink like ’em!